The beginning covers the biology, structure and importance of coral reefs. 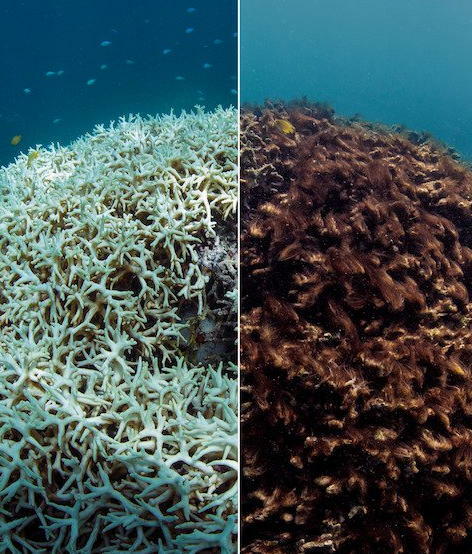 Then the severity of ongoing bleaching with coral reef death is explained. Destruction of our planet's coral reefs is a climate change impact that is happening now, and is an early warning of the catastrophes to come if we don't act decisively. This superbly crafted documentary is likely to wield an unexpected emotional charge. The film is particularly compelling when following Zack Rago, a self-proclaimed coral nerd whose love of the organisms is palpable and infectious. 1. Reduce, Refuse, Repair, Recycle, Repurpose, Rethink: although we have long adhered to these principles, with ACC they become vital in reducing our carbon footprint. By carefully following these mandates we can always find new ways to lower our personal footprint. 2. Conservation: the cleanest form of energy is not wind or solar or geothermal—it’s the energy you never use. It’s estimated the US wastes 25% of energy. With meticulous attention we can greatly decrease our individual energy consumption. 4. Renewable utility: if one does not have a home PVC system, using a 100% renewable energy provider is the next best choice. Green Mountain is available in most parts of Central Texas and offers only clean, renewable power. If TxU or other company states their power is from renewables, check carefully. I have been deceived by their claims in the past. 7. Education: climate science is a very large, complex, and fascinating field. There is always new information to absorb. The following are some of my favorite references. BOOK: “This Changes Everything” by Naomi Klein; “The Atmosphere of Hope” by Tim Flannery; “The Zero-Waste Lifestyle” by Amy Korst; “Climate Change” by Joseph Romm; anything by Bill McKibben; “Cooler Smarter: Practical Steps for Low-Carbon Living” by the Union of Concerned Scientists; “High Tide on Main Street” by John Englander; “The Rising Sea” by Pilkey and Young; “The Sixth Extinction” by Elizabeth Kolbert; “The Soil Will Save Us” by Kristin Ohlson; “Our Renewable Future” by Heinberg and Fridley. AUDIOBOOKS: Some of the books mentioned here are available at audible.com. WEBSITES: www.ecowatch.com , https://thinkprogress.org/climate/home, www.stateofourclimate.com PODCASTS: The Energy Gang, Democracy Now!, Talking Tesla, Cultures of Energy, Climate Connections, Sea Change Radio, The Climate Minute, Green News Report. CELL PHONE APP: Dark Sky (weather), Skeptical Science, Get Green, CO2 Emissions Calculator, Happy Cow, iRecycle. 8. Dealing with Climate Science Deniers: this is a frustrating business, but we all debate or attempt to convince deniers at some point. Here is a reference that provides great information to arm yourself for this endeavor: www.skepticalscience.com or the Skeptical Science app on iPhone. 9. No plastic bottled water: this product contributes to atmospheric GHG through oil required to produce the plastic, fossil fuel required for transport. Since it persists for 1000s of years, it inhabits our landfills, and contributes to the massive islands of plastic in the oceanic gyres. Animals ingest it and become injured or die and it enters the human food chain. Avoid this dangerous product except in emergencies. 12. Work with local climate activists: Waco Friends of Peace/Climate is a climate education and direct action organization, working in Waco for about 14 years. We usually meet the 3rd Tuesday of each month at 6pm, Poppa Rollos Pizza, Waco. More info: www.friendsofpeace.org. Facebook: Waco Friends of Peace—Climate. 13. Do online climate activism: several national organizations will send emails that allow you to sign online petitions/letters, or sign messages to various governmental officials. Examples are: www.350.org, www.greenpeace.org, www.sierraclub.org . 14. Oppose all new fossil fuel infrastructure: the science is clear that we must keep 70% of fossil fuel reserves in the ground if we are to keep global temp shift to 2 degree C. Thus we must oppose any new fossil fuel construction, including pipelines and power plants. One can be involved in protests and other actions against the Keystone XL, Dakota Access, and Transpecos pipelines, for example. 17. Low carbon farming: New techniques have been developed in which minimal or no tilling is performed, thus maintaining capture of carbon in the soil. Some proponents believe these techniques can play a large role in a low carbon future. Reference:” The Soil Will Save Us,” by Kristin Ohlson. 20. Weatherization: Tremendous amount of energy can be saved by improving home insulation and efficiency. 21. Real Science: To confirm scientific news is accurate, follow the link to the original peer-reviewed article. These papers always begin with an abstract or summary, and the name and volume/page numbers of the journal will be listed. 22. Questions: Feel free to email me at anorthc@aol.com.